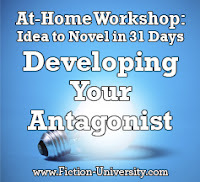 Welcome to Day Seven of Fiction University’s At-Home Workshop: Idea to Novel in 31 Days. The first twelve days will focus on developing the story and getting all the pieces in place so we can more easily plot the entire novel. Today, we’re focusing on the antagonist. The shadowy mirror of the protagonist is the antagonist. The type of conflict used in the novel often determines who or what this is (and vice versa). If the conflict is against another person, then the protagonist will need a worthy adversary. If the antagonist is nature or society, then the protagonist will be fighting against obstacles larger than herself. If the protagonist is her own worst enemy, then the antagonist will be someone who represents all that the protagonist is fighting. Villains (even villainous societies) can easily become cardboard clichés if we focus only on the bad and what the antagonist wants to do to the protagonist. The antagonist becomes a plot device to cause the protagonist trouble, not a fully developed character in her own right. But villains have feelings too, and even antagonists have some redeeming qualities. Why the antagonist is important: The antagonist provides the necessary conflict by giving the protagonist someone or something to struggle against. The fire in which the hero is forged. The better the antagonist, the stronger the protagonist will look. Since you figured out yesterday what type of conflict was at the center of your story, you probably have a good idea who your antagonist is, or at least where he (or it) comes from. Here are some things to consider when choosing and developing your Person vs. Person antagonist. 1. How did she/he/it get this way? 2. Is there honor or nobility to the antagonist’s actions? 3. What tough choices have been made? 4. What about the “evil plan” is actually worth pursuing? Here are some things to consider when choosing an antagonist for a Person vs. Self novel. 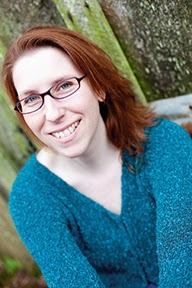 1. Who or what in the novel represents what the protagonist is fighting? 2. Who or what in the novel represents what the protagonist is struggling toward? 3. What place represents what the protagonist is fighting? 4. What item represents what she’s fighting? Here are some additional things to consider when picking a Person vs. Society antagonist. 1. Who represents what the society stands for? 2. Who is in the way of what the protagonist is trying to do? 3. Why does the antagonist believe in stopping the protagonist? 4. Does the antagonist sympathize with the protagonist’s argument? Here are some things to consider when picking a Person vs. Nature antagonist. 1. What’s the purpose of nature in the novel? 2. What does nature represent? 3. How does nature get worse over the course of the novel? Not just the physical look (that’s okay if you know it already), but the type of person he or she is and any history you might know at this stage. Try to get a sense of who this character is and how the novel might unfold with an antagonist like this. If the antagonist represents what the protagonist is fighting (as in a Person vs. Person or Person vs. Society conflict), then describe how this person fits this role and what they’ll be representing. If the antagonist is nature, describe how this will cause trouble for your protagonist. 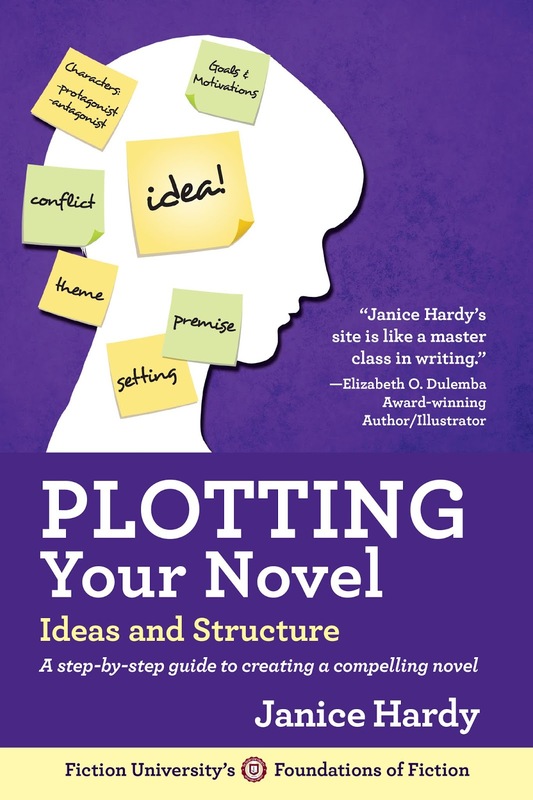 Those following along with the PYN book: Workshop Four goes into more extensive detail on developing your antagonist and determining the role he or she will play n the novel. Tomorrow, we’ll look at developing the character arcs.